I’ve been looking for an easy to use, free (or low cost) digital signage solution since forever. Back in the Le Grand days, Danny Silva hacked together AppleTVs and iTunes to create digital signage for our school. For the past several months, I’ve been playing with RiseVision and chromeboxes. I had it to the point of being able to display a RiseVision template but found trying to get the content into the template frustrating. 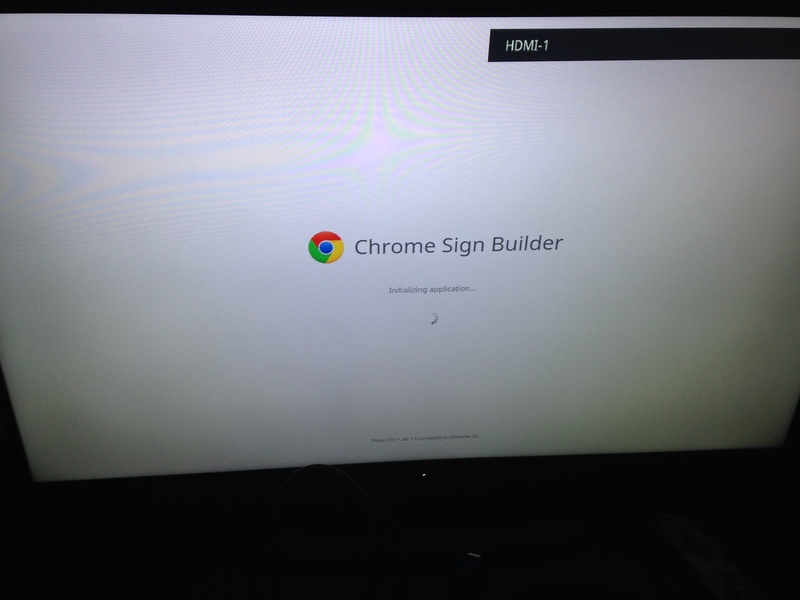 Friday I did a search for “Chromebox digital signage” and found Google Sign Builder! Sign Builder is an App for Chrome devices that can display URLs and Youtube Videos and best of all, it’s all controlled through the Admin panel. There is a Schedule app that creates a txt file with the schedule and resources defined which is then uploaded through the admin panel and pushed to the chromeboxes that have the Sign app installed. It’s very slick and easy. I was able to get everything setup in less than a hour of fiddling and had a Google Sheet auto-looping in about 5 minutes. The hardest part of the whole thing was finding the Schedule Builder app, because it didn’t show up in the Chrome Web Store. Simon Miller (@LeadEdTech) got ahead of me by adding a YouTube video to his schedule and is now playing with the refresh. I’ll be experimenting with that on Monday. So far, it looks like this is the solution I’ve been looking for. 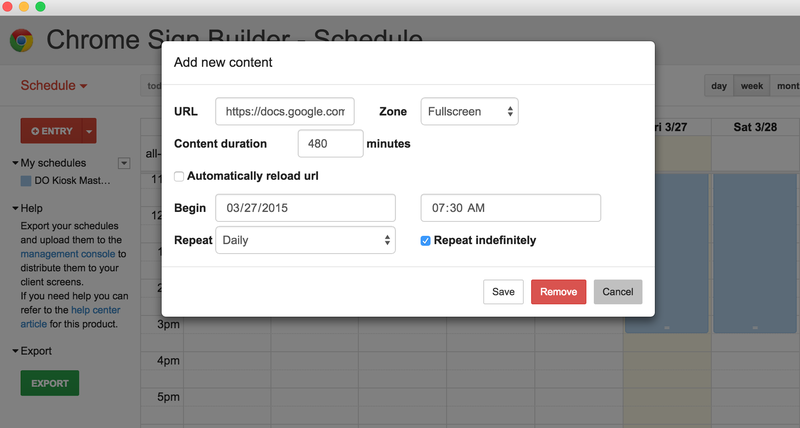 A shared Google Sheet per site will allow users to easily update their own content. If we need to push a district notice, it’s as easy as updating the schedule for each Sub Org (assuming policy refresh works). I can’t wait to play some more on Monday. Setup a Device Sub Org and put your Chromebox into it. I called ours Kiosk. I plan to create a Kiosk Sub Org for each site. The schedule, and therefore the content displayed on the screen, is applied at the Sub Org level. Deploy Chrome Sign Builder as an Auto-Launch Kiosk app for your Kiosk Device Sub Org. Create and Publish a Google Sheet. I created a Kiosk User that I can use to create sheets with and then share out to each site/department. Build and Upload a Schedule. You’ll need this link to get the Scheduling App since it doesn’t show up in the Chrome Web Store yet. Do you have the link to the Google Sign Builder app ? It seems Chrome store cannot find it ? Any help or info on setting this up on a single device such as Chromebit with out a Google for work account? You need Google managed accounts to use this with the admin console. That’s what allows you to schedule the kiosk app. I have been working on this to just try to get the app installed in the Google Apps Admin. I do not see anything about Kiosk or forcing anything into Kiosk. I guess I just do not know where to look. I have my digital signage OU, I think there is a big step that I am missing. Any help would be most appreciated. I’m having the same issue as Randy. I’ve found the App Management page but am unable to locate or load Chrome Sign Builder. Not sure how to find it. There seems to be no URL search and keyword searching in the store isnt working. I was wondering if you could explain how you got video to autoplay. Was it playing on it’s own. I found that if I added as part of a slide in a presentation it would not play automatically. I too have played with Rise vision. I found it a pretty simple to use. I like how the video works in it and the fact that you could turn audio off on the video. They did a great job by doing a hangout and demoing what can be done. I realize Chrome sign builder is new but most places today do give some documentation and or videos on how to use such a product successfully. I think that’s a huge over site on releasing this. Risevision took about 2 hours to learn ( because of their video) and I have already invested 4 hours in this with not the same quality of presentation displayed. I still have lots to learn about this product but from simplistic point of view I think Rise Vision is a lot better thought out product. No admin needed other than to push the kiosk app. I think that’s pretty cool. In a school district every school has their own person doing signage and to know none of them will ever need admin to work with the product is a huge plus. Rather than add a Video as a presentation you can add a Youtube video directly with a URL. Then it should auto play. Or that is what I believe Simon Miller (https://twitter.com/LeadEdTech) found out. I haven’t had time to play with it since getting the Slide presentation to play. If I am understanding correctly I could mount a TV and connect a Chromebox to it and then go through the steps that you described? Would a Chromebook work? Could this also be used to force a presentation onto every chromebook that is running or would they have to switch to the kiosk app? I am in the beginning stages of setting up digital signage at a new school and I was horrified by the cost of a server and players. This would be amazing if it works because we are already a GAFE and Chromebook school. I’m trying to do something similar. Annoyingly it seems that the video controls only work for Youtube, not for videos hosted on Drive. Also the Youtube adds pop up on the video as it is streaming. Can’t you turn off adds on your own YouTube videos? Good point, I was just testing with a NASA video. It would still be nice to share from Drive. Did you ever get a chance to play with a refresh policy? Are you guys using a google presentation for any of your signage locations? I need digital signage that an average user can develop content for, and google signage seems to be a great (reasonably priced) solution as they can essentially edit a ‘slideshow’ with the content they want. The biggest downsides I’ve found so far is content refresh seems broken for me, and if you embed a video in a slide it doesn’t autoplay and I can’t find a way to force it to. Seems pretty half-baked compared to risevision but i’m afraid risevision is too complicated for my users. I’ve set the Chromebox to reset nightly. That reloads the Google Slides every night. Haven’t messed around with the video yet. RiseVision becomes costly (as I have just found out) so I am scrambling to get this ging. Thanks, Andrew, for showng the steps to deploy. Now for the fun part- figuring out how to replicate the signage I had in Rise Vision in Chrome sign builder….. There are far less features in CSB, so hopefully your RiseVision signage was simple. May I ask, what has made RiseVision become so costly for you? Any idea what the “Collections” are for? I was told by a google implementation partner (Cloud Sherpas) that collections “Do nothing”. This was who google sent me to when I started asking questions about their platform– so about as close to out of google’s mouth as I think you can get. You can upload your content there then when typing in your URL you’ll be able to pull it up by name. Are the zones just what they sound like? Can you show 4 things at once on the same screen? Also, how do you embed a video in a google slide? I put one in but it advances the slide before it even loads. How do you make a specific slide wait longer than the others? There is no way that I’ve found (or that Cloud Sherpas know of) to give each individual slide their own duration. It is global for the slideshow and each slide gets the same. There also doesn’t seem to be a way to make videos auto-play. The google slides solution is effectively a no-go for implementations that require video. What are the “zones” you speak of? Is that option in google sign builder or within slides itself? The zones is a chrome builder setting. If you look at the picture at the top of the post it says zone: full screen. You can change that to corners. Ahhh, yes, I see it now. I’ve completely glossed over that setting when setting up my signage. Seems neat in theory but I don’t have an application for it in my situation. Has it proved to be useful for you? I’ve been struggling with Google Sign Builder mostly because the Google documentation is not for anyone who hasn’t already set it up. I wanted to just run a Slides show for a charity kitchen. I called Google and they didn’t want to help at first but then they called me back and we got it running. The big problem is – can I make it easily update-able. The elderly office assistant is charged with updating this rules, regs and menu, Slides presentation once a week. Currently she uses LogMeIn to update a Power Point on an old Windows machine. This computer is misbehaving. So I needed an inexpensive replacement. So again this has to be easily update-able and it has to be updated remotely even if that remote location is in the same building. 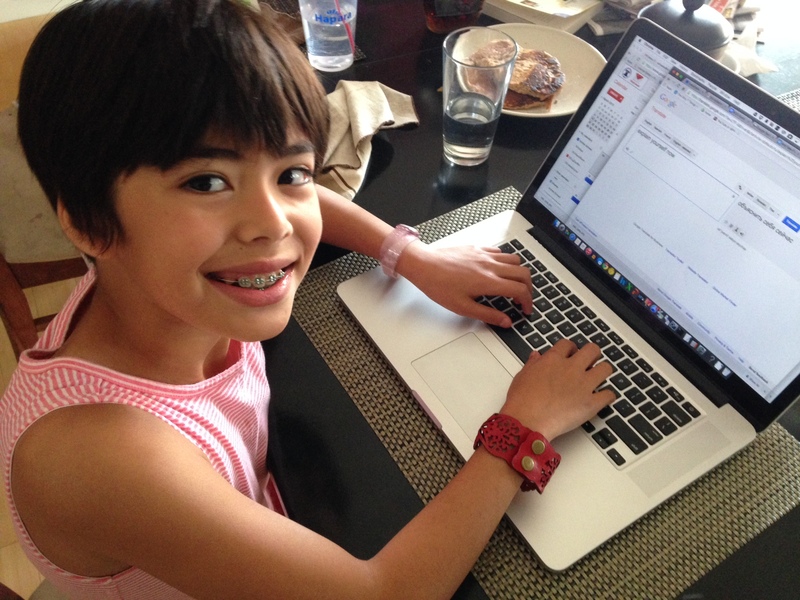 I can show her how to go to Gmail>Slides>Kitchen presentation and update times and dates. But beyond that I think she’d get lost. The big problem is that when you change some of the slide contents the Chromebox Sign doesn’t update until the Chromebox is restarted. Andrew wrote on Sept. 11 that he set the Chromebox to reset nightly. This would kind of solve my issue if it works. I found instructions elsewhere on how this is done on a Google Meeting computer so I went to the same spot for my signage box on my Admin console. Long story short it seems to allow a reboot every day but it doesn’t say what time. Perhaps I’m in the wrong spot. If there is another way to get this to auto update I’d appreciate a suggestion. Automatically reload url every _____ seconds is an option in the chrome sign builder when adding new content. I’ve set this interval to every 10 minutes and it’s been working fine for us. I also made my slide durations match up with this reload interval. So 4 slides at 15 sec each = 1 min. So in theory when the 10 minutes hits and it reloads the url is should match up naturally with the slide interval. In our case the reload is so fast most people prolly wouldn’t notice anyway, but your application may vary. Thank you so much! I didn’t see that option. But then I wasn’t quite sure what URL they were talking about when I first started. I then stumbled on something that said you have to publish the Slides to the web and copy the URL. Geeze I wish Google had better documentation. Thank you!! Yeah, the documentation is abysmal. Happy to help! Glad you got it working. I am very interested in this topic as my school has several flat screen tvs that we are using for signage. I have used Publish Google Slides, that automatically update when new content is added, embedded in a Google Site with a chrome add on called easy refresh to get things to work. However, after reading all your posts and several articles on Google Sing Builder there is much more possible. My question is, do the chrome devices that are connected to the tvs have to be enrolled in the Device Management in the Admin Console in order to get this to work? My understanding is that it is possible, but not recommended by most. I don’t think there is anything technically preventing you from doing it with an unmanaged device but I don’t think this config is supported by google. I thought I saw instructions from google on how to launch the sign builder app without a management license, but I can’t find it anymore. Maybe I’m making that up. Thanks, Jeff. I will keep you updated. Gotta check out Chrome Bit. It’s a Chrome Box – on a flash drive. Tiny, MDMI, and Bluetooth Keyboard/mouse. Plug it into a TV, and you have an $89 sign. Don’t forget $30 Google license. Just set up two chromebits on flat screen’s for signage at my school. Took me about 30 minutes. It’s up and running now, and easy! My chrome digital signage displays started offering to “check out the new presenter view”, which is a smallish popup in the bottom left of the screen (where the slideshow controls appear if you plugin a mouse in to the chromebox and wiggle it). I used the mouse to click the “Got it!” button on the popup yesterday, but it appeared again this morning. This isn’t so bad for me, because we keep a wireless kb/mouse dongle plugged into the chromebox as we also use the display for trainings, but I imagine in the wrong situation clicking “got it” would be quite troublesome (especially since it doesn’t go away forever). Is anyone seeing this annoying little new popup, and have they found a way to dismiss it permanently? I see that pop up and complained to Google about it but was told it can’t be dismissed permanently on a looping slide scheduled to kiosk. Looking for alternatives but can’t find any that don’t charge monthly fees. We change our content on a daily basis and plan to deploy to more screens but no way we are going with some of the more expensive alternatives. I’d go back to using Intel compute sticks and publish slide show on Wndows for free before I pay for expensive alternatives. They seriously told you it can’t be dismissed? This is their official google digital signage solution, and they can’t turn off this “new feature notice”?! Who did you talk to? Did they seem like they were actually “in the know” with regards to digital signage? To tell a customer “sorry, too bad” seems unbelievable. And certainly unacceptable. I found the a solution. For those that don’t need the controls at all, you can hide them by adding &rm=minimal to the URL. There is also a way to keep the controls and banish the popup, but it’s not as elegant as it adds the controls permanently to the bottom on the screen on a bar, but this bar uses 50 or so pixels at the bottom of the screen and shrinks your content slightly. To do this, you change pub? to embed? in the URL. But if you don’t need the controls (as I imagine 90% don’t), just use the &rm=minimal to remove the controls altogether. I thought I had replied to this already, but I think this blog requires mod approval before any comments are posted. So either I screwed up in posting or the previous post got lost in mix. In a nutshell, adding &rm=minimal to your URL will hide the controls, which in turn also hides the “try the new presentor view” message. Hi – Our school just implemented Rise Vision and I don’t find it easy to use. Our main challenge has been using google slides. When you used Rise, did you have trouble finding a solution for updates to show on the published slide show through Google Slides? any help would be appreciated. I found rise vision very difficult in the beginning but I love it now. Google slides works great for me. If you want I can give some of the code I used to make it work. I messed with risevision briefly and would also be interested in seeing the code that makes this work. I guess I should spend more time with risevision, because I also found it frustrating to use. If I can embed google slides in a risevision presentation and maintain the ease of collaboration and security slides provides, while gaining additional features not currently possible with google docs, I would be very pleased. [googleapps] is clearly shortcode of some sort. Did you have to install a risevision widget to make that work? I didn’t find a google apps widget or anything obvious that would make this shortcode work. Using your code in an html widget only renders the line of code and nothing else. This was a very helpfull post. I’d like to see more of this! Andrew. Do you need a chromebox? or can you just use your computer as org unit? Hi, is there tip, best practice to play video hosted in the cloud or on the network that are not on YouTube ? We use screen.cloud – low cost, great quality! This setup has helped me a lot thank u for sharing.keeo sharing such posts. Has anyone found a way to use Google Sign Builder without having the chrome device managed? Great thread with a lot of helpful content. I have set up the chrome bit and testing and working great in kiosk mode with the signage I want – I have set this up at home, Does any know what I happens when I take to an actual site that has a different wireless network? I hope I get prompted when it boots to connect to a wireless network! I think you will have to use the special shortcut to interrupt the signage from loading (I think it’s control shift S or control alt S?) and then load into the chrome OS desktop and connect to the new Wi-Fi network. Then restart and let it boot to the signage like normal. I’m not positive but I don’t think it will prompt to connect any other way. This is a great idea! Currently my school does not allow for managing Devices in G-Suite so I am going to see if I can get the ability to do that. Have been looking for a fairly cheap solution for running signage on 3 separate TVs and this looks the most promising that I’ve seen. Chrome sign buider is not working for me right now. I am using a new schedule. My old stuff works. The default slides don’t update, When I do have a schdule content playing when the time is up it does not switch back to the default slides. If when I an setting up a new schdule and input th epulished slide url, then open advance and select hide controls, it breaks teh original url I put in there. 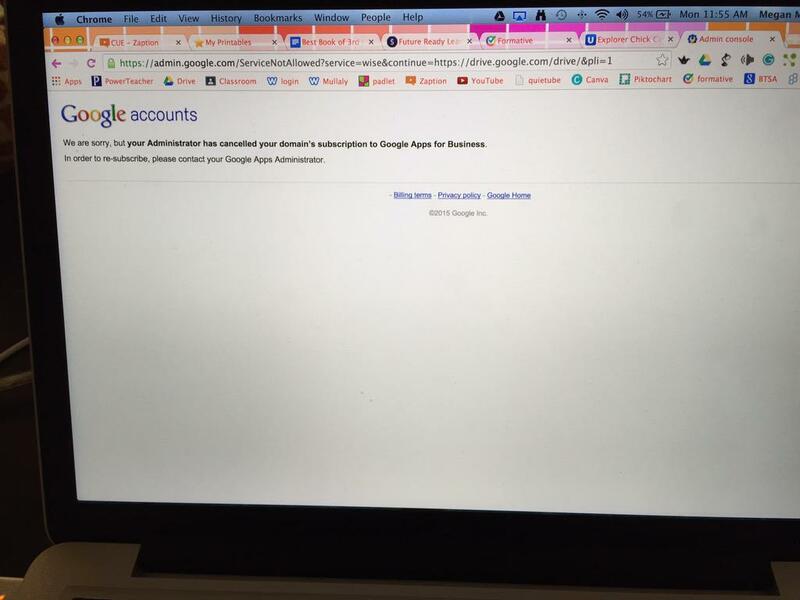 I deleted my school’s Google Apps Domain for Education today but probably not for the reasons you might think. Ok, technically I cancelled the subscription which deletes all accounts and data, but same thing. You see, somewhere along the line, our GAFE domain got flipped to a Nonprofit for Work domain. We only found out because we hadn’t received our unlimited drive storage yet. Having waited patiently through the new year, we opened our second support ticket (the first time we were told to wait patiently) and were then informed that because we were not a GAFE domain, we weren’t eligible for free storage. After a double-take, I was informed that we were in fact listed as a Nonprofit for Work domain, which coincidentally enough also has Google Classrooms, and that to get unlimited storage, we would have to downgrade from Nonprofit for Work and then re-apply to be a GAFE domain again. And oh, by the way, all of our Google Classrooms would be reset. The same Google Classrooms that teachers have started using like wildfire. The same Google Classrooms that are used to deliver our District Wide Writing Assessments in 6-8th grades. Um, yeah, not going to happen. I asked for an escalation and immediately emailed Jaime Casap, Education Evangelist at Google. I waited about 20 seconds for a reply and then tweeted at him too. He got back to me within a few minutes and said he’d look into it. Fast forward to this morning and a call from a Google support engineer. Our issue had been escalated, they had a script that would downgrade our domain and upgrade it to GAFE while keeping our Classrooms intact, and all without causing any interruptions to active users. I asked about that last part several times, and each time was reassured this had been tried and verified many times. Nervous but willing to try, I agreed to run the script, figuring it was better for something to go wrong at the end of a minimum day with Google support on the phone than later in the day without one. So he emailed me the link to the script, I ran it and it prompted me to login to the clark county schools domain. Oops. Apparently they had the same problem too. New link, new attempt, this time it ran but didn’t get the expected result. It just gave me a click here to continue and took me back to the Admin panel. The support engineer, let’s call him Manny, had me open an incognito window and try from there. Nope. Then he had me check the domain’s super admin and change it to match my super admin username. I ran the script again. Nope. Manny politely asked to put me on hold for 2 minutes, my nerves ratcheted up because clearly the script that had worked several times wasn’t working for us and I was starting to second guess the whole thing when Manny came back on and requested a Google Hangout to share the screen. We did that, and then he had me login to gmail in the incognito window and launch the link to the script from there. Same result. Not what he was expecting. I could hear him typing away with what I could only assume was an engineer somewhere in the cloud. When he spoke again, he said we’d have to do it the manual way. Ok. We went into the Admin panel and he had me click on Nonprofit for Work and select Cancel. At this point a very scary screen came up and asked if I wanted to permanently delete the domain and all the accounts and data in it FOREVER, or if I just wanted to kind of delete them for 4 days, during which time I could cancel the deletion. At this point, Manny went, Hmmm and asked to put me on hold again. When he came back on, he told me to select the delete FOREVER option, I take my hand off the mouse and calmly asked him, “and we won’t lose any Google Classroom data OR gmail accounts OR drive data?”. To which he said, nope. So in the biggest leap of faith I have ever taken with support, I clicked delete. Manny kept reassuring me that he could see all of our accounts and data, and could I just enable Work a little faster, but no pressure! Once I had Work enabled, he flipped it over to Google Apps for Education in less than a minute. We verified people could log in again (same passwords), that our data was still there and that things like email still worked. Then we checked out Classrooms and found everything intact. Yay. People didn’t have to enter captchas, mobile logins didn’t need to be reset and unlimited storage is now a reality. No data was lost in the process but my nerves sure took a beating. A few little things got dropped, like custom URLs for google services, but those were minor fixes. In hindsight, it was a risk deleting the domain, but I asked Manny several times if it would be ok, asked if he was sure that this was what we had to do and would our data and accounts be ok afterward, and each time he reassured me that yes, our data would be ok and I believed him. Because despite the initial script failure and the hiccups, at the end of the day I trust that Google has smart engineers who can solve hard problems and if the whole thing ended up blowing up, I had faith that they would fix it for us. Yes, at times, I felt like those Apollo 13 astronauts must have, radioing back to Mission Control for support and like them, we made it through. I used to trust Google with our core collaboration and messaging platform because I hoped that Google had the kind of enterprise engineering support that I could never afford to staff as a school district. After this experience, I know they do. 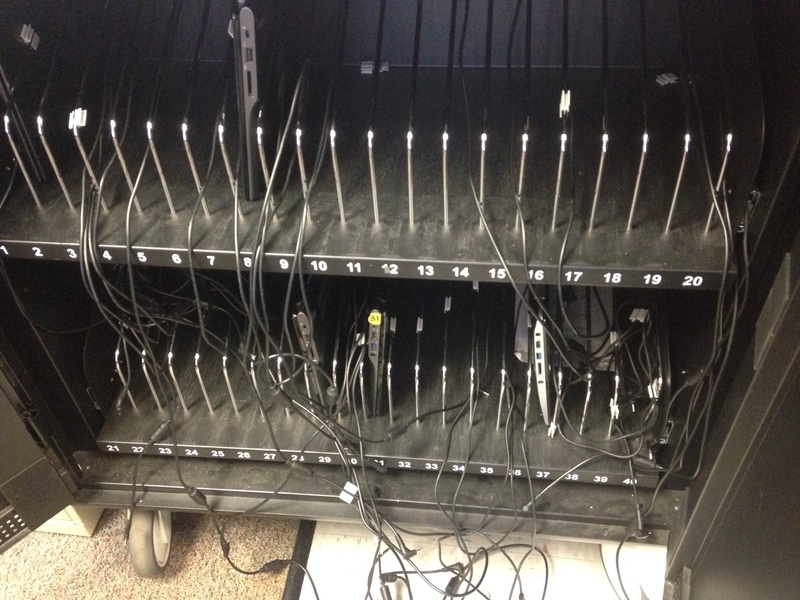 Mobile carts are a necessary evil in classroom 1:1 programs. I’d much prefer to send devices home with students to keeping them locked away when school is not officially in session. Be that as it may, we have a lot of carts. For our last round of chromebook carts, we went with the Aver TabChargeCT2. Feature wise it ticked all the boxes. Intelligent charging, capacity for 40 devices, rugged construction and a flat top for teachers to store stuff on. All in all, it’s a great cart. However, we’ve discovered an inconvenient flaw in the cable management design. Power cord management is always a challenge (my favorite cord management to date is found on the Anthro Yes carts). With the Aver, the pull out shelf makes it even more important. The Aver cart comes with little plastic clips meant to hold the cables along the upright spacers. The clips are two sided, one side being larger than the other. At first we were installing our power cords in the big side, not realizing that they were actually different sizes. After a few weeks out in classrooms, we started to see the result. Power cords coming loose all over the place. We went back and put all the cords in the smaller side, which was not easy. A few more weeks later and we were right back in Spaghetti central. The clip is a decent solution for Adults, but if you stop and watch how kids handle the in and out of devices in mobile carts, you quickly realize, a bomb proof cart is not good enough, it has to be Superman proof. Another reason I prefer sending the devices home with kids to storing them in classrooms. Aver ChargeTab2 after a few months in the classroom. Instead of following my initial instinct, which was to go back through and zip tie the power cables to the uprights, I called Aver. They came out right away and took a look at what was happening. They’ve gone back to the drawing board for a fix and have committed to retrofitting our 100 carts. That’s the mark of a great company. We’re currently evaluating the TabChargeCT2’s little brother, the C30i, for use in our mixed device K-2 pilot. The C30i is a nice little cart, but it has the same power cord clip system as the TabChargeCT2. As soon as Aver get’s the spaghetti issue fixed, we’ll probably be ordering a few truck loads of the C30i. What’s your favorite mobile device cart and why? Have any power cord spaghetti pictures to share? I solved this problem by taping the cords with electrical tape where the clips were. The results: manageable cords! I also numbered the cords on the tips and put numbers near the metal slots on the cart using a silver sharpie so students knew which slot their computer goes in, as well as, which cord to use. I used the sharpie to number the computers as well. I’ve just gotten 4 of the C30i carts in and I’m having a terrible time getting the cords organized. The diagram that came with the paperwork shows holes that you are supposed to be able to put the power cords through to the pull out trays. No holes in any of them, so I’m having to drape the power cords over the opening. I can’t stand spaghetti cords! Aver has come up with Zip Ties as the answer. We’ll be Zip Tying all of our carts this summer. Mike Magboo’s (@allurbaser) latest post hit me like a ton of bricks. I’d honestly forgotten that at Le Grand High School, we were doing 1:1 netbooks running ubermix way back in 2009. I know if feels like I’ve been doing 1:1 forever, now I remember why. Reading Mike’s post, it is clear that Le Grand has continued to evolve and learn to the point where their 1:1 program isn’t about the technology anymore, it’s about teaching and learning. That’s #eduawesome because that’s where we all need to be to be able to prepare today’s students for their futures. It took me a few false starts since leaving Le Grand, but roll forward to today and once again I find myself in a forward thinking organization that got the basics right. Together we are continuing to reflect, adjust and move teaching and learning forward. In both cases, these organizations were future ready before being #FutureReady was cool. It’s good to be a part of organizations like that. I’m in the middle of a nightmare scenario with our current wireless access point provider at the moment. Our 8-month old Aerohive AP230 access points randomly freeze up after 30 days and stop passing traffic until we reboot them. It’s a particularly insidious bug that has disrupted classrooms and consumed a significant amount of my team’s time, first in troubleshooting and convincing Aerohive there was a problem with the AP230s and mitigating the effects on our teachers and students. We’ve resorted to manually rebooting all of our 235 AP230s weekly as a preventative measure to get through online testing. Unfortunately, it turns out Aerohive doesn’t have a reliable way to schedule an AP reboot. All of this got me thinking, with the move to online state assessments, good enough isn’t good enough anymore. I came from the private sector where I was responsible for IT in a 24x7x365 production facility. In that high stakes environment, if things didn’t work at 3am on a Saturday, millions of dollars ran down the drain. I spent a few 3ams troubleshooting failures and many more hours designing potential failure points out of our systems. Then I went to work for a school district. Nobody called or emailed on weekends and when the Internet stopped working I was the only one that noticed. It was night and day. Not so anymore. Now the first people to notice technology problems are classroom teachers. When the wireless is down in a classroom, we know right away because the teacher calls us immediately. If the Internet is slow at a school site, we get three or four calls or emails in rapid succession. In fact, we have become so dependent on the Internet for our day to day operations, both in our offices and our classrooms, it’s starting to feel a lot more like that 24x7x365 environment. I’m having to dust off some old ways of thinking that I wouldn’t have applied to K12 just a few years ago. Like just how redundant is our Internet connection and where are the major points of failure in our network and what is the backup plan if we get a bad batch of Access Points? The new one that I’m thinking about now is, if all of our stuff is in the cloud, what does a day without access to our stuff cost us? These are scary questions to ask in a school district, because right now, the truth of the matter is very few of our systems are redundant. Our network is built on point to point fiber connecting single core switches running through one firewall out to our County Office of Education. The County Office has some redundancy and they are looking at ways to provide more, but that doesn’t do much to address the LAN side of the equation. All of our email and increasingly our documents are in the cloud. Student learning is happening in the cloud. Teacher resources are in the cloud. K12 IT Departments are going to have to evolve to take on the new demands of providing services in 21st Century learning organizations. As much as I would like to think we can offload complexity to the cloud with services like JIVE, Meraki, Securly and hosted solutions from our County Office of Ed, each of those represents a significant relationship and requires a high degree of trust. We are highly exposed and incredibly reliant on our service providers and vendors like never before. My experience with JIVE last year was a pre-cursor to our current crisis. We rely on these outside vendors to provide the best possible quality products, services and support with at least some understanding of what it means in a classroom environment, what it means to teacher confidence and student learning, when their technology doesn’t work. I don’t know that the education sector technology providers are necessarily used to school districts demanding industry class uptime or support. I don’t think we complained all that loudly if things didn’t work in the past. Well, those days are surely over. Online assessments are here and the cloud is the operating system for our organizations. Time to put on the big boy pants. To automate reboot of AP, just create a scheduled script to turn off then turn on the switch interface where the AP connects. It is a hard reboot, but it may work. And I’m off. Heading to the Airport. Soon to be at CUE15. I can’t believe it’s CUE time again. As a CUE Board Member, we receive status updates throughout the year about conference preparations, but it’s actually here! While I’m not presenting this year, I do have some Board duties to perform. If you see me directing traffic at the doors to the keynote sessions, be sure to say hi! In my free time, I do plan to check out some great sessions (see the session guide for all of them, warning, prepare to be overwhelmed). I’m really looking forward to the Thursday morning session in Oasis 4, Weapons of Mass Instruction with Hall Davidson and Jon Corippo. That is sure to be an awesome amazing show. I’m trying to wrap my head around getting over to the UnCon at the Hard Rock Hotel. As a huge #edcamp fan, I’m down for some self directed PD as a break from the overwhelmingness that can be CUE. One way or another, I’ll make my way over to hang out and enjoy some good conversation. Of course I’ll probably stop in the hallway for some good old fashion #hallwayPD time. There are a few topics I’d like to talk about that aren’t on the schedule. IT stuff like wireless access, chromebooks and Google Apps domains come to mind. Beyond that, I have to make sure I get over to Hamburger Mary’s for lunch with Mike Magboo. It’s become something of a tradition. I’m also looking forward to visiting Sherman’s Deli for at least one lunch, and maybe more. My fingers are crossed on the wifi. I’m confident that CUE has spared no expense and done everything possible to ensure that the wifi can support 5500+ computer using educators and presenters this year. But wifi is hard and CUE users use bandwidth like Californian’s use water. I hope someone tweets out the graph of bandwidth utilization during the conference. I am fortunate to be able to send twelve teachers and three administrators from my district to CUE this year. I hope they have the same incredible and overwhelming experience that I had when I first came to CUE. I remember feeling like I had finally found my tribe. A group of passionate educators that were also passionate about technology. Risk takers, explorers, innovators, lone nuts, novice and master educators all with an eagerness to share and learn in the exciting and amazing space that is EdTech. Whatever happens over the next few days, I’m looking forward to hanging out and taking it all in because spring CUE only happens once a year! It all starts with a concept, based on discussions about what we think we want to do in the classroom. We know that desks in rows do not lend themselves to collaborative learning. We also know that rigid seating leaves students without freedom of movement. Desks and chairs without wheels make reconfiguring spaces quickly a challenge and therefore much less likely to happen often. We know this from observation and conversation. So we collaborate with a furniture distributor that specializes in flexible learning environments in schools. We brainstorm, look at options, examine our spaces, budgets and learning objectives and the results of all of those discussion are turned into 2D renderings. Then, after refining the size, shape and layouts based on the 2D renders, because collaboration tables are bigger than we thought or we just can’t fit 34 desks and chairs in the space the way we want, 3D renders are made and we really start to visualize what the space will actually look like. Once everyone agrees to a layout and equipment list, we discuss finishes. Light table tops show dirt. Dark table tops show dirt. Wood grain table tops show the least amount of dirt. Chairs will get dirty, do we want colors that show it or hide it? Do we want different colors or a standard color that is easier to replace and move from school to school. Once all of these questions are answered, the furniture is ordered and the conceptual becomes reality. This is where reality sets in. We learn a lot about furniture. Making the transition from a static, standardized classroom to a flexible, dynamic learning space is a huge leap. Some assumptions are wrong. Both 2D and 3D space is different than the real classroom. Tables could be a little narrower to facilitate groups of four collaboration. Different desk shapes work well for groups of six but not four or five. Chairs with wheels have bigger footprints than we are used to and legs that stick out further into the isles. We find out that trying to add new furniture in with existing furniture makes for tight spaces. Layout is important as well, for movement isles as well as for seat alignment. 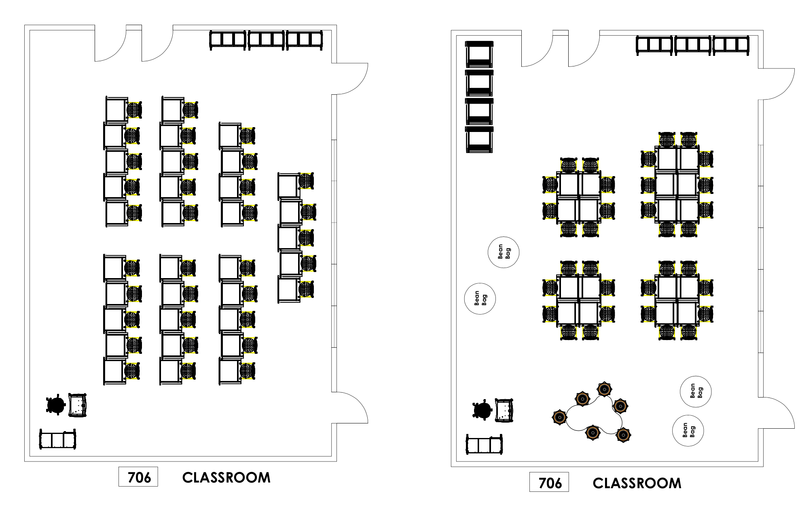 Transforming a classroom space is a major disrupting force. One that not every teacher is necessarily ready to take on. 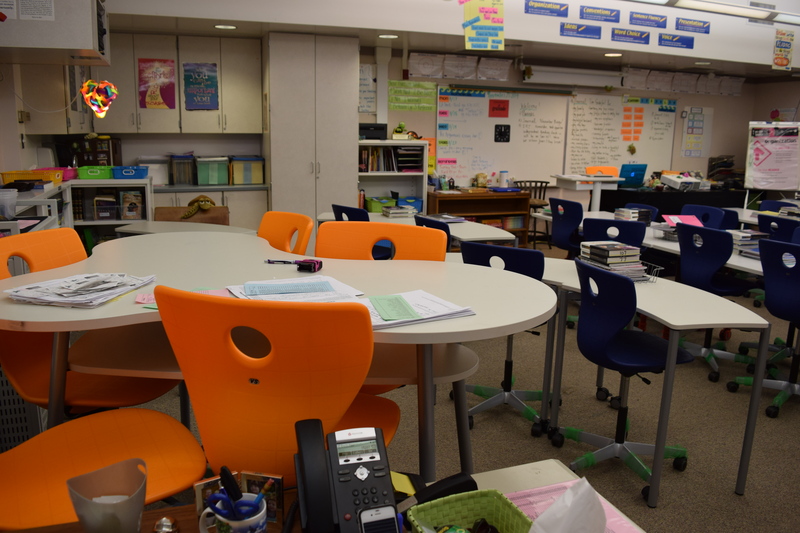 Teachers that agree to take on the challenge have to be willing to clear their classrooms of existing furniture but also be prepared to question their pre-existing notions of what a classroom should look like and how they and their students should interact with the learning environment. Students must be involved in the process from the beginning. Teachers need to have students participate in the exploration, reconfiguration and feedback loop for the flexible learning spaces. One size will not fit all. Finding a desk shape with the most flexible configuration is important. It’s amazing how flexible the old reliable rectangle is. It does groups of 4, 5 and 6 very well. New desks should also do these well but also provide for circles and curves and other shapes. Storage is a challenge. Teachers have a lot of stuff. It accumulates over time. Also, elementary students don’t travel the way middle and high school students do, so they are used to having their own book box to store things in. The flexible furniture of today doesn’t come with a book box option. Wire baskets are available and they are a must. Wheels on everything. Tables, chairs, everything. Standing height tables and cafe stools are very popular with students. Allowing options for seating throughout the day seems to be important, however moving past the idea that every student has to be sitting at the exact same desk is an obstacle to truly flexible learning environments. 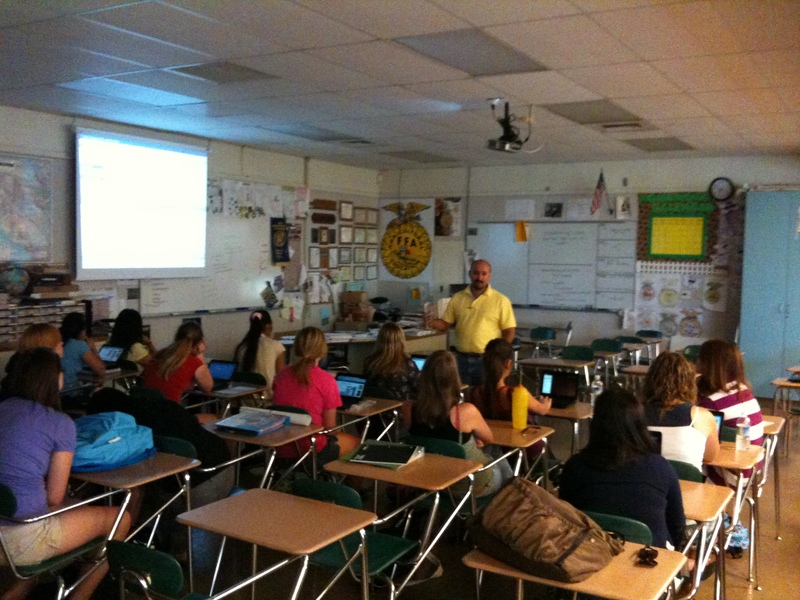 Teachers need a place to present from, but it shouldn’t have to be at the front of the classroom. A mobile standing height platform with storage is popular with teachers. This is in addition to a teacher desk for one on one student collaboration. Flip top tables in a custom 20”x60” size for middle school. And maybe for Elementary too for teachers that don’t require book boxes. We’ll be piloting some of these in the next round. 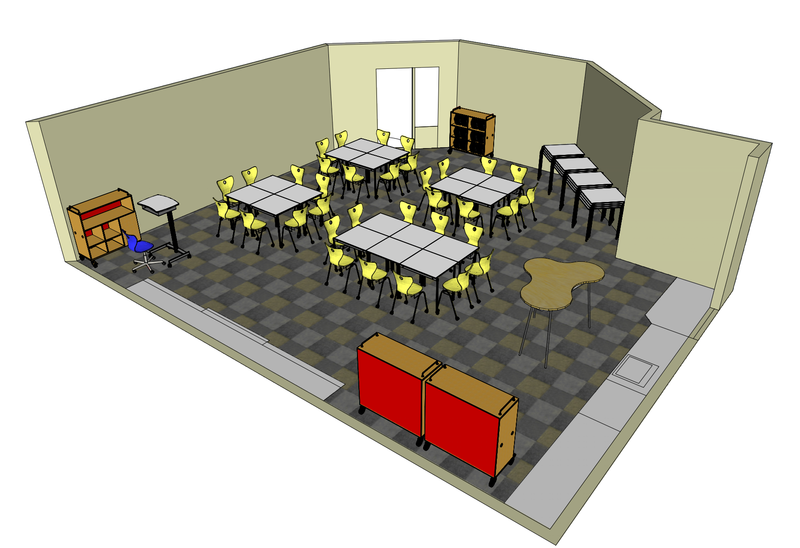 Whereas the first round of pilot classrooms were really shots in the dark about what flexible learning environments should look like, the next round of classrooms has a much more focused design. We have an individual desk shape we think is flexible enough to meet most needs. We’ve refined the table for the middle school classrooms and will be trying it out in elementary classrooms as well. And we have several chair options that we are looking at since we’re finding the wheeled chair to be the most difficult piece of the puzzle. Next up is finalizing designs, creating equipment lists for each classroom and placing the order. Another thing I’ve learned is that furniture has long lead times. Trying to condense the feedback loop with classroom teachers has also been a time challenge. With another 10 classrooms entering the pilot, I’m sure we’ll be getting great feedback. This time, I’m hoping to validate what we know now and come up with a set of district standards that work for us moving forward. But to hedge our bets, I’m also ordering our own “Pilot” set of classroom furniture for the district office, so we can push it into classrooms, swap out components in our pilot classrooms and generally be more flexible without having to relay on vendor samples and availability. Who knew furniture could be so fun? Furniture with wheels likely have wheel locks. Make sure the lock levers are strong, preferably steel and can lock the wheels tightly. Students find ways to stomp on them, kick them, and unlock them during use. they should be functional but unobtrusive. Furniture without wheels need hard rubber “feet” that will not scuff the floor, fall off when lifted, or crack from frequent dragging. What is the brand of the furniture in the picture? I am looking at getting some of those chairs but I can’t seem to find that exact kind! Excuse Me – How The World Has Changed! Wow, using google translate with the kids to explore how to say “Excuse Me” in other languages. Only five years ago they would have had to listen to me butcher the pronunciations and we would have been limited to Spanish, French and German. How the world has changed. My District is looking for amazing educators to fill two brand new Instructional Tech ToSA positions for next year. These positions will report to me (the CTO) in the Technology Services Department and have the opportunity to work with Mary Fran Lynch, our current #eduawesome Instructional Technology ToSA. We’re a Google Apps District, MacBooks and iPads for all teachers, 70″ LED TVs, AppleTVs and Chromecasts are being installed in every classroom this summer. We are 1:1 Chromebooks 3-6th with a 6th grade 1:1 take home starting next year. We are also piloting tablets (iPads and nexus 7) and chromebooks in K-2. We currently have 7 flexible learning pilot classrooms, expanding to even more next year. Great things are happening in Union School District! For any IT centric folks, I’m thinking about facilitating a session in the Renaissance Lobby sometime during the CUE conference. Preliminary title, “Chromebooks: The How and the Why” or alternatively, “iPads: Not Yet, Because”.